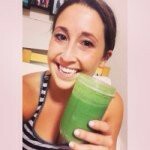 I decided to create this blog in order to easily give you recipes, workouts, and interesting nutrition information. The information you’ll find here is a from my own health perspective as I learn and grow as a trainer and nutritionist. I will never be a bodybuilder that diets down to a completely unrealistic size for a competition, and yo-yo diets all over the place. I believe in total health than can be easily maintained for LIFE at a healthy, happy body weight. I don’t believe in ridiculous diets, cutting out food groups, or doing juice cleanses. I don’t believe in obsessing over the number on the scale- the scale does not measure strength, power, fitness, or self-worth and happiness. I don’t believe in over- training, but rather finding a way to make fitness consistent and fun. I believe in eating healthy because of how amazing it feels, knowing what you are putting in your body that will fuel effective workouts… and still enjoying that glass of wine, ice-cream, and chocolate too. I want my clients to create a life that includes fitness, and good nutrition while enjoying every step of the way to better health. I am CSEP Certified Personal Trainer, and A Registered Nutritional Consultant. I run boot-camps, teach spin, TRX, aquafit, aqua-spin, and do personal and small group personal training in my new personal training studio. I’m also available to create meal plans custom made to you and your goals. Want to learn how to meal prep? I can take you around the grocery store, teach you what to eat and what to skip, and then teach you how to cook simple and delicious meals that will last you the whole week of working and busy life. I got your info from Julie Bazin. I was looking for some help with nutrition/diet as well as some tips for exercise and just general information. I’ve recently started to make some lifestyle changes but really want more direction and some accountability too. It looks like from your website that you offer these things and more. I would love to talk and see what we can arrange. I would like to comment on your blog posts, but it doesn’t seem to be working. You invite comments, so perhaps this is a setting error? One of the links – for a coping strategy flow chart- is dead. I am interested in this mythical chart. I really appreciate the content and your writing style. Hi Erica! So sorry about that I will look into my settings, thank for the heads up! Let me see if I can find the mythical chart for you haha. So glad you like my writing style! I have your e-mail on here so will try e-mailing it to you.